The Singer 128 seen above may be our most attractive Singer. The decals are beautiful. In fact, it is too nice for Jim to use as he is afraid he will put a scratch on it. Serial number is AC620355 indicating it was made in Elizabeth, New Jersey. 15,000 units were authorized 24 April 1929. Compare the model above to the one below and notice differences in decals, chrome wheel and light. 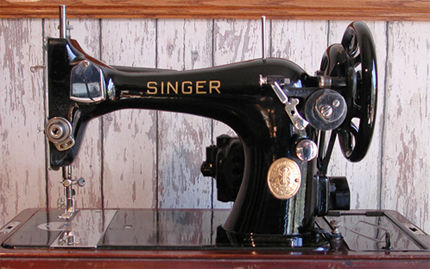 Click here for a larger image of our beautiful Singer 128. 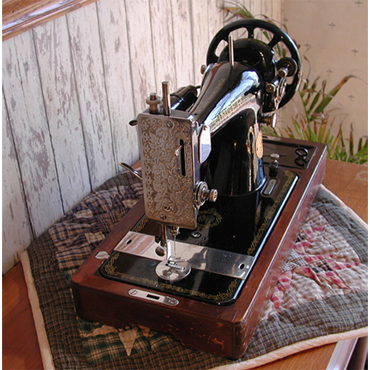 This is the first machine with an oscillating "bullet-shape" shuttle and long bobbin that we have actually tried to use. 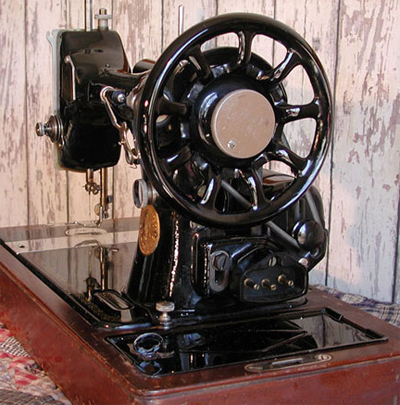 Since the machine is in such good condition and also attractive for the era, we wanted to keep it on display but also get some use out of it. There were problems at first which we fiddled with for several weeks after bringing the machine home. A small burr on the shuttle caused skipped stitches, bird-nests of thread in spots on the bottom of the fabric, puckering, etc. 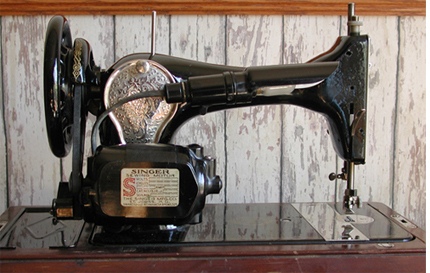 Knowing very little about its operation, Jim slowly rotated the balance hand wheel until the lower thread hung up. He then carefully isolated the source. With both slide plates open, it was just a matter of continually rotating the wheel toward oneself and watching the thread being pulled over and around the shuttle. 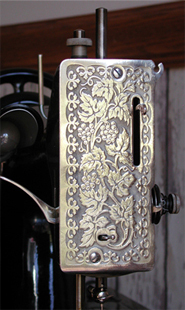 The burr, which was on the bobbin rear-end, was sanded off and the area polished resulting in perfect stitches. In fact, the burr, by preventing consistent stitching, may be why the machine appears to have had little use. A new electrical cord was made by cutting a new 15-foot extension cord into two pieces. After cutting off the multiple outlet, a 5-ft. section was used for the foot control. The remaining 10-ft. was used for the power supply line. The male end of the cord was retained for the power input. The spring that holds the bobbin winder follower against the heart-shaped cam is either broken or not connected properly and is on our to-do list. The machine is 3/4 size and uses 15 X 1 needle. The downside of this 128 is that it sews only forward. The feed dogs can't be lowered but they can be covered by accessory plates. The stitch length is adjusted by turning a knob above the logo; however, there is no indication other than physically inspecting your work to determine your stitch length. Jim waxed the 128 with automotive wax which removed paint oxidation. Care was exercise to ensure that the decals were not damaged. 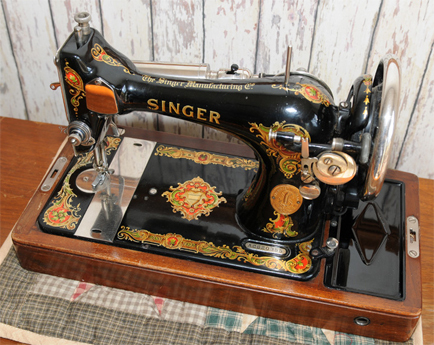 This Singer 128-13 has one of our best embellished faceplates. (We think!) 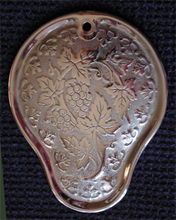 The faceplate and rear pear-shape access plate are simply beautiful pieces of art. Serial number of this machine is JC169946. According to Singer, it was manufactured during 1948. 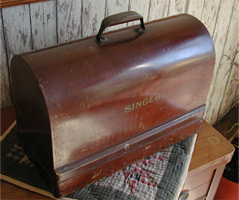 Singer 128 dome-shaped wood carrying case.